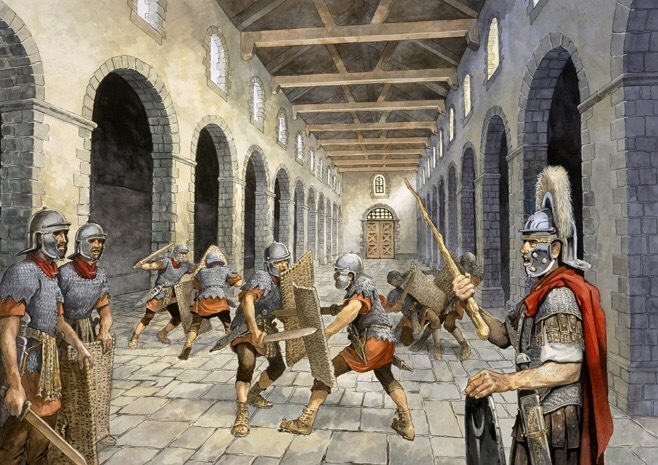 A common phrase used during my days as a crow at Depot Para in Aldershot was “Train Hard, Fight easy” and from research, the Romans were no different. 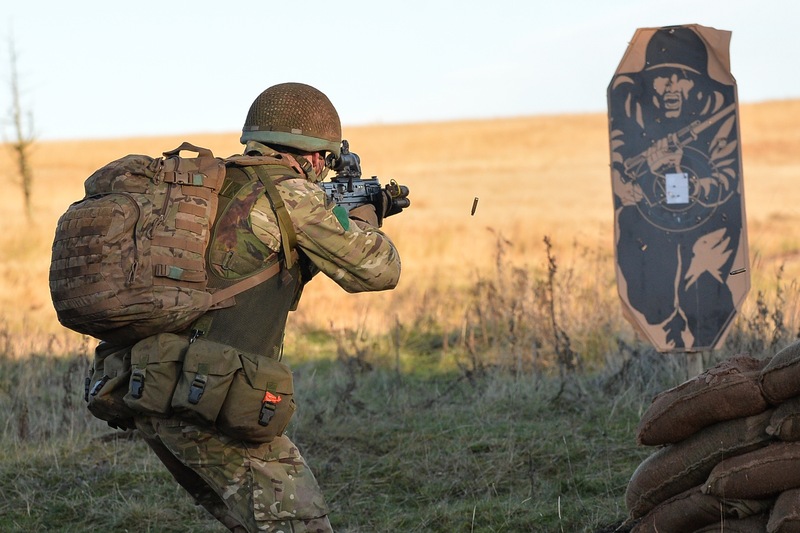 It is evident to see where the British Army adopted its training doctrine from, which is still used today. The first thing the soldiers were taught was to march. The historian Vegetius tells us that it was seen as of greatest importance to the Roman army that its soldiers could march at speed. Any army which would be split up by stragglers at the back or soldiers trundling along at differing speeds would be vulnerable to attack. 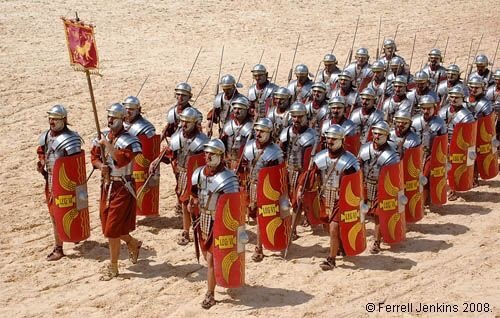 Hence right from the beginning the Roman soldier was trained to march in line at the same pace and to keep the army a compact fighting unit on the move. 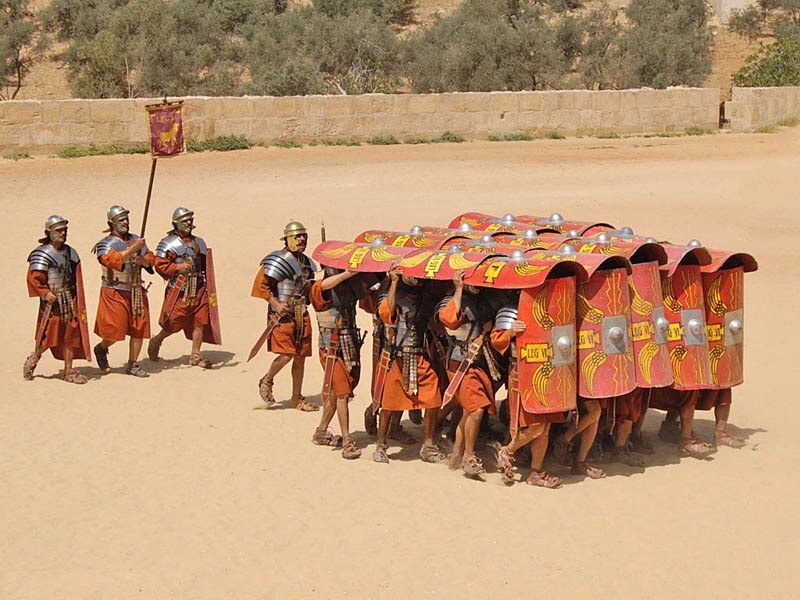 One of the Romans most famous formations was the Tortoise (testudo). Testudo is the Latin word for “tortoise”. The soldiers in front and sides interlocked their shields. The soldiers in the back lines placed their shields over their heads to form a protective “shell” over top of the men. For this, we are told by Vegetius, during the summer months the soldiers were to be marched twenty Roman miles (18.4 miles/29.6 km), which had to be completed in five hours. In the British Army we call this a TAB Tactical Advance to Battle. Vegetius mentions running, long and high jump and carrying heavy packs. During the summer swimming was also a part of training. If their camp was near the sea, a lake or river, every recruit was made to swim. Next in line, after the training for marching and fitness, came the training of handling weapons. The correc use of the gladius and scutum. For this they primarily used wickerwork shields and wooden swords. Both the shields and the swords were made to standards which made them twice as heavy as the original weapons. Evidently it was thought, that if a soldier could fight with these heavy dummy weapons, he would be twice as effective with the proper ones. The dummy weapons were at first employed against heavy wooden stakes, about six foot high, rather than against fellow soldiers. Against these wooden stakes the soldier trained the various moves, strikes and counter-strikes with the sword. Only once the recruits was deemed able enough in fighting against the stakes, were they assigned in pairs to train in individual combat. This more advanced stage of combat training was called armatura, an expression which first was used in the gladiatorial schools, which proves that some of the methods used in training soldiers was indeed borrowed from the training techniques of gladiators. The weapons used in the armatura were, though still of wood, of the same, or similar weight as the original service weapons. After completing the initial training with the sword, the recruit was to master the use of the spear, the pilum. For this the wooden stakes were put to use again as targets. The pilum used for practice was, once again, twice the weight of the regular weapon. The Modern day army being live firing tests. Vegetius notes that weapons training was given such importance that in some places roofed riding schools and drill halls were built to allow for training to continue throughout the winter. 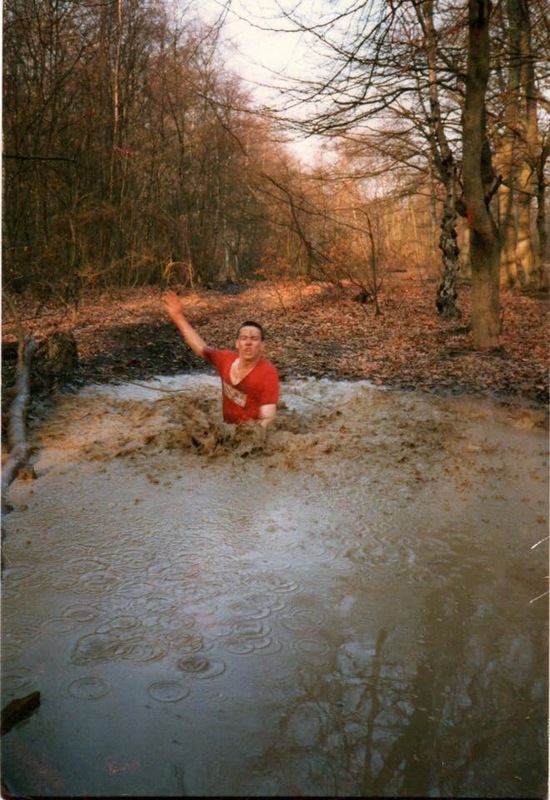 Like my time at Depot Para, Physical conditioning and skill at arms was the bread and butter of soldiering. Without them you would not last long or be able to progress. 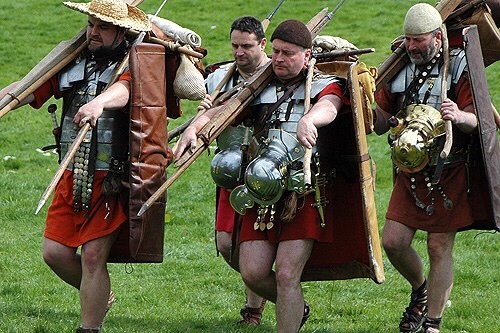 The Roman Army recruits were progressively trained to a high standard as you can see from the following. 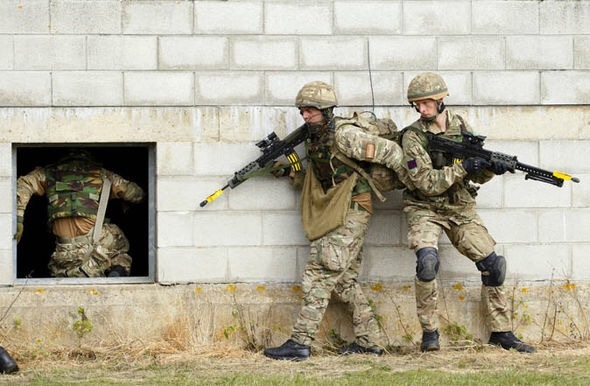 The British Army are no different. 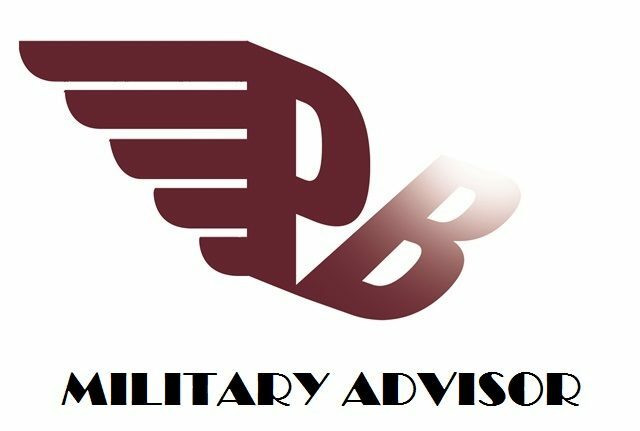 Attestation (a formal ceremony to join the British Army), kit issue, administration, weapons training and Exercise Icebreaker (teaching Exercise) – your first night in the field. Weapons training, introduction to foot drill and Military Swim Test. Weapon training, physical development and potted sports. 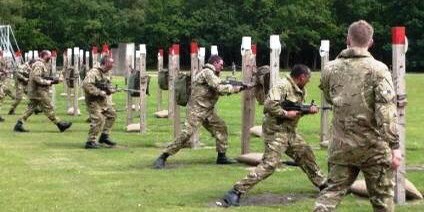 Weapon Handling Test, introduction to Live Firing and Platoon Commanders Activity Day. Exercise First Night (Teaching Exercise) 2 nights in the field, followed by Exercise Valliant Spirit – a trip to Ypres (Realities of War). 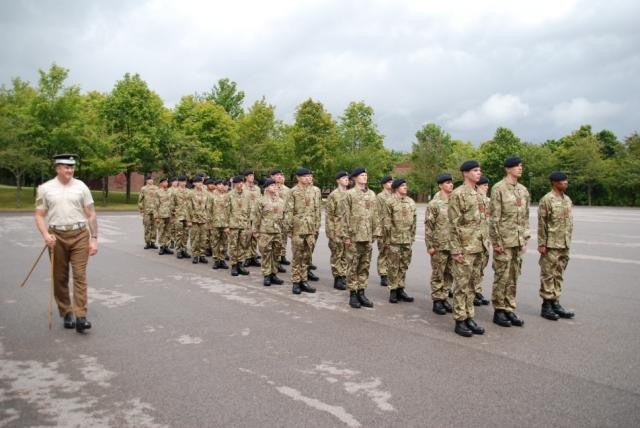 Phase 2 Visits (a chance to see where you are going next and meet others like you who have already passed out), foot drill test, families’ day (a chance for your family to come and visit you) and a long weekend. 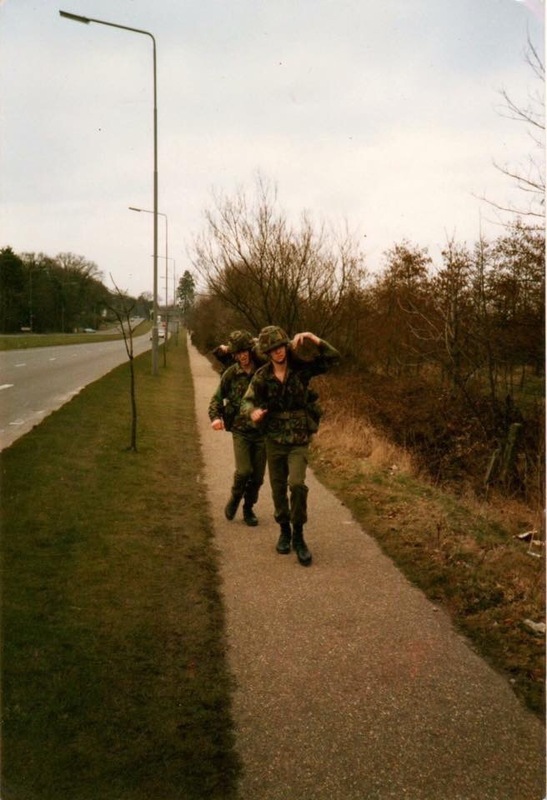 The Author during Basic training in Aldershot.